Terrific Tuesday: For the love of reading! 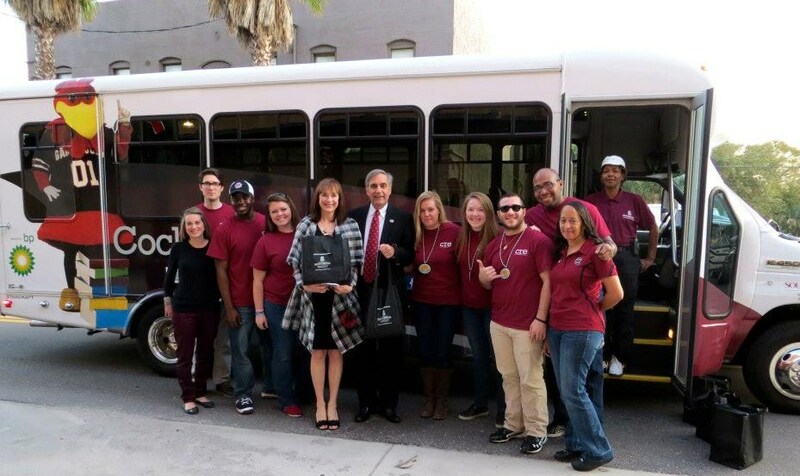 USC President Harris Pastides and his wife, Patricia Moore-Pastides, are shown with student volunteers for the Cocky’s Reading Express program in South Carolina. It’s no secret. We love to read! Reading is at the heart of everything that we do, and every child should love to read. That is why on this “Terrific Tuesday,” we applaud Cocky’s Reading Express, a literacy program launched by the University of South Carolina’s student government in 2005. Cocky is USC’s award-winning mascot who represents the University’s academic and athletic programs. Loved by children and adults alike, Cocky travels with USC student volunteers to visit elementary schools, primarily those in underserved public school districts. During their visits, USC students read to children in grades 4K through second grade, and Cocky helps the children understand the importance of lifelong reading. Each child is given a book to keep as a reminder of Cocky and the students’ visit and their promise to Cocky that he or she will read every day. How great is this! An immediate success, the program became a joint collaboration with USC’s School of Library and Information Science and is now housed at the S.C. Center for Children’s Books and Literacy. Just how successful has this program been? More than 715 students have participated in Cocky’s Reading Express, which has traveled to all of South Carolina’s 46 counties. To date, more than 56,300 books have been distributed at over 300 events. Grants from BP America, Bi-Lo, Verizon, CCCF, the Sunshine House, SCBT and the Barbara Bush Family Literacy Foundation have supported this outstanding program. And just so you’ll know, I have had the opportunity to mingle with Cocky and student volunteers at the annual Read-In at the South Carolina Statehouse! What a great honor for me! Visit http://www.libsci.sc.edu/ccbl/cockyreadingexpress/index.htm to learn more about Cocky’s Reading Express! We appreciate everyone who is part of this important outreach program that is encouraging the same love of reading that Mom Karen and I have! Why do you love to read? And who has helped you learn to read and appreciate books? And don’t forget: I am honoring a student, teacher, school, community organization, business or other individuals who have excelled in promoting the love of reading, writing and literacy. Send your nominations to LouiseSpeaks@gmail.com, and Mom Karen will write you back!